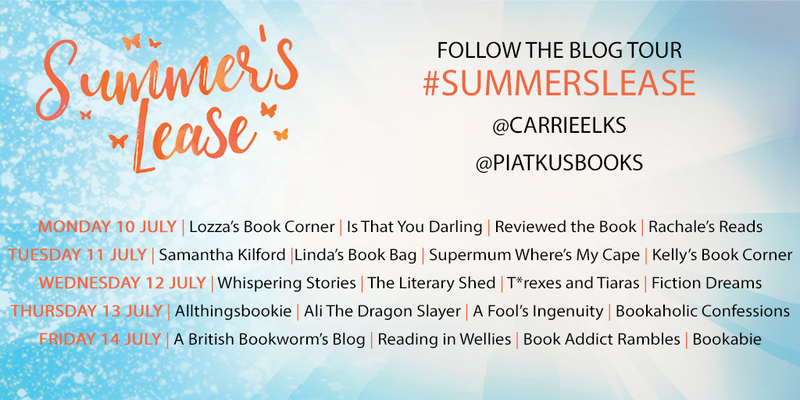 A massive thank you to Piatkus Books/Little, Brown UK for sending me a copy of Summer’s Lease and inviting me to be a part of the blog tour. Over the course of the hot Italian summer, Cesca and Sam have to come to terms with their pasts. What begins as a tentative friendship quickly grows into an intense attraction – and then a scorching fling. But they can’t hide from reality forever as their different worlds collide, Sam and Cesca face a choice: is this just a summer romance, or could their love weather even the coldest winds? Summer’s Lease really has set the bar high for my summer reading. I didn’t go in expecting much, just an easy, breezy summer romance novel. Yet, by chapter three I was hooked and unable to put it down. I rarely say this, but I believe that Elks’ new novel is sheer perfection. After finishing the entirety of Summer’s Lease in just two days, I’m taken aback by just how deeply I came to care and fall in love with these characters. With Elks’ effortless way of weaving in comedy, romance and a whole lot of heart, there’s never a dull moment in Summer’s Lease. You’ll start by disliking Sam Carlton – and rightly so, he is partly responsible for Cesca’s downward spiral after her play bombs. But as Cesca and Sam work out their differences, with a good mix of fighting and flirting, we learn more about both of their tragic pasts. There were times when I was swooning along with Cesca, but there were also times when I was sobbing with tears. Trust me when I say that by the end of the book, you’ll be wishing you had a Sam Carlton. Thinking about that first date and the scene at Cereal has me giddy all over again! As a Shakespeare nerd, I was already intrigued by the leading lady, Cesca, and her wonderful surname. However, I died and went to Shakespeare heaven when I saw that Elks had included little quotes from his works at the beginning of each chapter. It’s a very lovely touch and what makes it even better was that each quote relates exactly to the action happening in the chapter itself. I thought it was complete and utter genius! I have nothing but high praise for Elks’ novel. Of course, the romance between Cesca and Sam could be considered far-fetched, but that’s the way romance novels are and I think their blossoming love is what makes it so easy to lose yourself in this book. What amazed me was that Elks didn’t shy away from admitting her characters were flawed and we see this as they confront their pasts. It’s so well thought out and it was so engrossing as a reader to follow both their journey together and their own personal journeys from start to finish. My understanding is that this is the first in Elks’ upcoming Shakespeare Sisters Series. If Summer’s Lease is anything to go by, then I’m eagerly awaiting to learn more about Cesca’s sisters. In the meantime, I’m making it my mission to read more by Elks and I suggest that you do to!